One day, Amy and I were headed to Oakland to check out the California International Antiquarian Book Fair (it’s way more awesome than it sounds, I promise). This year, the event relocated from its usual San Francisco venue to the Marriott City Center Convention location in the Piedmont neighborhood of Oakland. Well, I’m pretty much always on the hunt for great, cheap sushi and I knew we would need to grab a good lunch before heading into the event, but I wasn’t very familiar with the area’s food selection. So, I pulled up Foursquare and did a quick search to gauge my options. Immediately, I was presented with an obvious lunch solution – a tiny hole-in-the-wall well-regarded for its quality fish and reasonable prices called Geta Sushi. We showed up around noon on this rainy Friday afternoon and just barely beat out the local Oakland lunch rush. It’s a really little place with only a couple of tables and sushi bar seating to service the entire place. Luckily, we were seated at the sushi bar almost immediately and were able to place our orders shortly after. It’s a basic, no-frills shop with just enough server attention to have your needs attended to while retaining its laid-back vibe. The service was fast and efficient and they did quite a nice job flowing people through their meals happily and quickly. From start to finish, we couldn’t have been inside the restaurant for more than 30 minutes and we were perfectly happy with that. 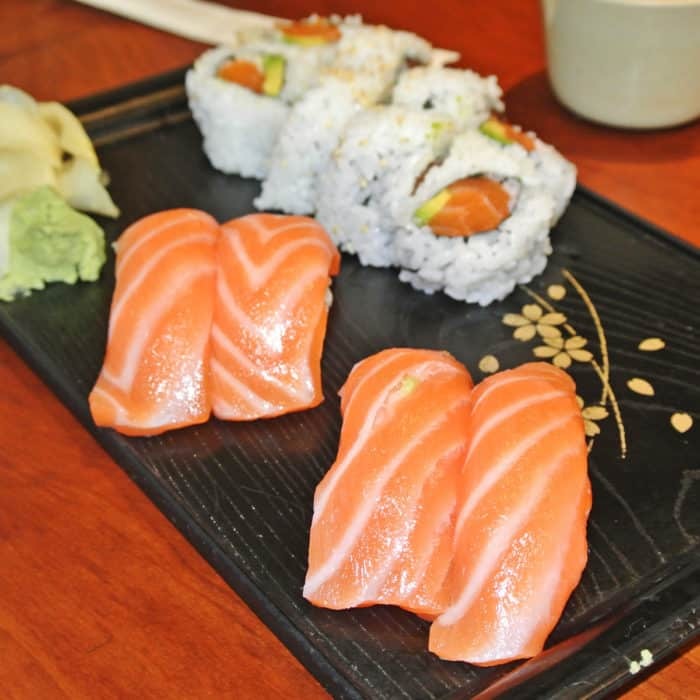 Lately, Amy’s been on a real salmon sushi kick and this trip was no exception. Predictably, she went for a few orders of Sake Nigiri along with a Salmon Avocado Roll. I also ordered a bit of salmon nigiri for my meal and was happy I had the chance to enjoy this truly excellent salmon. The flavor and texture of the fish was outstanding – it was so fresh and buttery and highlighted the high-quality salmon extremely well. And at only $3.95 for a pair they were a steal. Where’s Amy’s sushi addiction is salmon, mine most certainly has become scallops. In addition to my Salmon Nigiri I got a pair of Hotate Nigiri and a Spicy Scallop Roll which each highlighted the fresh, raw scallops they serve at Geta. I always love the light, refreshing, oceany flavor of those large, fresh sea scallops – especially when they’re served in nigiri form. These big ones at Geta were an excellent rendition and another great deal at #3.95 for a pair. The Spicy Scallop Roll was outstanding too, but there was something about it that really surprised me. This roll was apparently filled with fresh, bay scallops as opposed to rough chopped sea scallops like I’m used to finding. I actually really loved this unusual twist that made this roll differ from similar ones I’ve had elsewhere. The roll was generously stuffed with those fresh, fantastic little sea creatures which were tossed in spicy mayo and poppy clusters of fresh fish roe and I couldn’t have been happier with the result. At $5.95, this was another excellent value. I rounded out my lunch with a classic pair of Maguro Nigiri because I just couldn’t resist the bright red tuna flesh color I saw eyeing me in the sushi case. Once again, these pieces were quite good, but unsurprisingly I didn’t find the tuna nigiri to be as flavorful or exciting as the other seafood options. These pieces were probably my least favorite of the bunch, but they weren’t bad by any means, especially for $3.95 for two – I just enjoyed my other sushi much more. All in all, everything was outstanding. 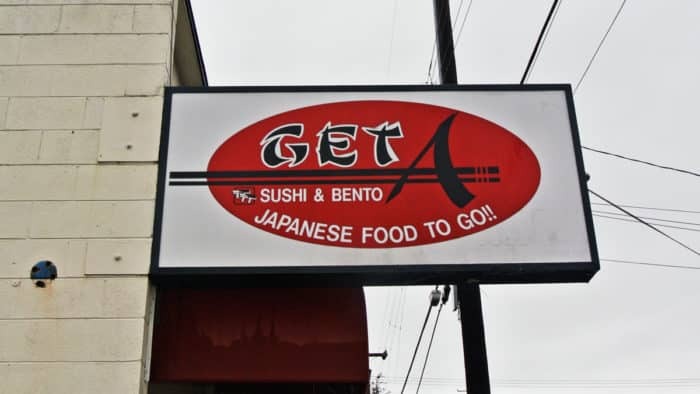 So, if you live, work, or just happen to find yourself in the Piedmont neighborhood of Oakland and end up craving raw fish, I’d highly recommend a quick stop into Geta Sushi. 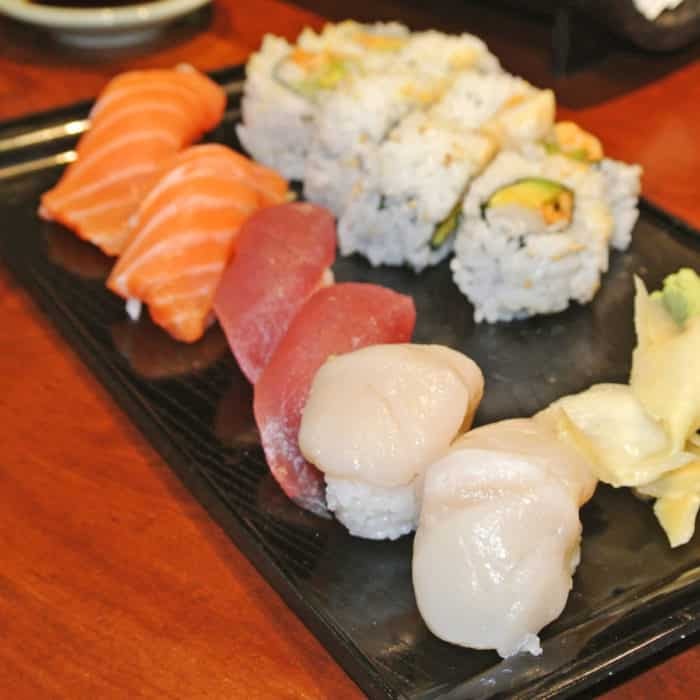 This tiny spot is fast and efficient at getting customers in and out of the restaurant while still managing to put out top notch pieces of sushi at very reasonable prices. Another illusive cheap, quality sushi spot has been uncovered! Got another great sushi shop in Oakland that I should check out? Let me know in the comments below.